Most people who own an iPhone 3G know they can watch videos but they may not know how to exactly. So the following tutorial is dedicated to helping you learn how to watch DVD movies and videos of various sources on your brand new iPhone 3G. So, in order to enjoy DVD's and videos on iPhone 3G, you just need to rip the DVD movies and convert the video files to video/audio formats iPhone 3G accepts, and then transfer the output video/audio files to your iPhone 3G with the sync of iTunes Library. Note: If you are using a Mac, please go to: How to Convert DVD to iPhone/iPhone 3G/iPhone 3Gs on Mac? Click the "Open DVD" button if the DVD movie you are going to enjoy on your iPhone 3G is on the disc drive. If the DVD movie is saved as a folder on your computer, you need to click the "Add Video" button to locate that folder, which is composed of two separate folders: VIDEO_TS and AUDIO_TS. From the VIDEO_TS folder, select the .vob file to import and then click "OK". After the DVD or video is imported, you can preview it on the main interface. If you only want a clip of the DVD/video, you can drag the "Start to trim" and "Stop to trim" button to get the certain segment. Note: If you don't need the DVD ripping feature, you can just get Clone2Go Video to iPhone Converter, which enables you to convert videos in various formats and online YouTube videos for your iPhone 3G. Note: From the profile graph above, we can learn Clone2Go DVD to iPhone Converter also applies to converting DVD movies, video files and online YouTube video to video formats for iPod, Apple TV, etc. 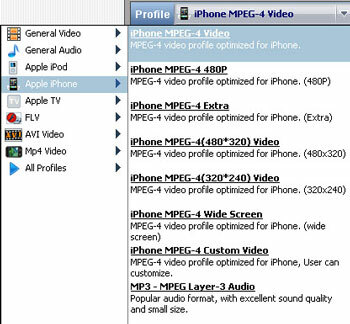 And now you can click the "Start Encode" button to starting ripping DVD's or converting videos for your iPhone 3G. Note: The output video/audio files are easily available by simply clicking the Folder button on the main menu after the ripping/converting process is done. How to rip DVD to iPod/iPhone/Zune/PSP/BlackBerry/Phone/AVI/3GP/WMV/MP4?